I had planned to start this post with a bit of waffle about how I had knitted a cowl that was perfect for crisp Autumn mornings and keeping me warm while waiting for the train, which would all have been true, but last week it seemed we had skipped autumn entirely and plunged straight into winter! We had hail and freezing southerly gales blowing straight off the fresh snow on the southern alps, as well as spectacular thunder storms, it was all very dramatic and unexpected! 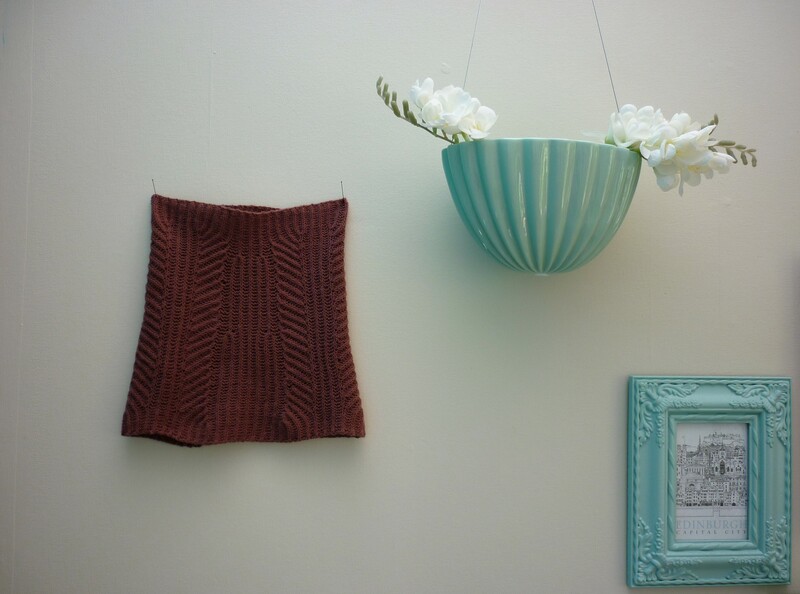 This is the Gully Cowl, knitted in Brooklyn Tweed’s laceweight Vale yarn. It’s lovely and smooth and soft, and I love how squishy and three dimensional it is in this brioche stitch pattern! I initially meant to pick the pale pink version of this yarn (Arabesque), but I put the wrong colour into the Holland Road Yarn website when I was buying it and ended up with this slightly darker, muddier pink (called Barberry). I actually love it, on reflection the pale pink might have been a bit too wish wishy-washy for my pasty winter face! 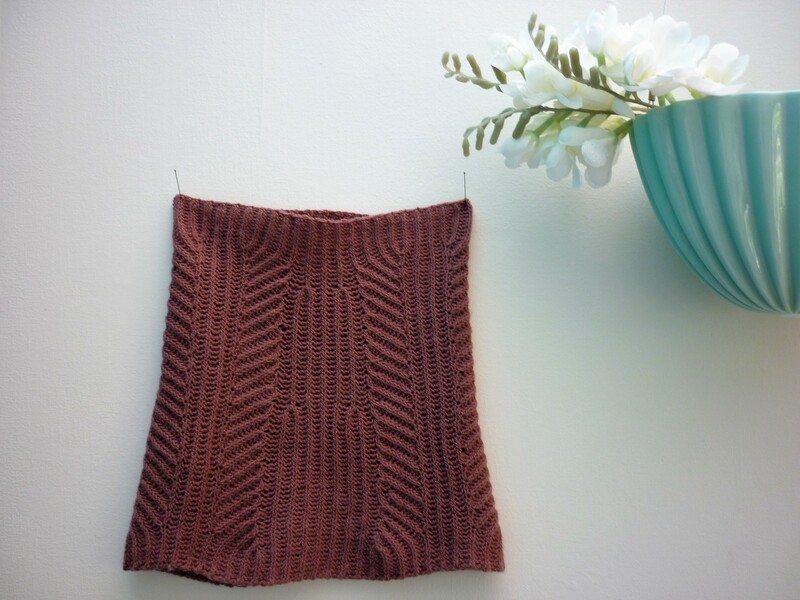 I love the Art Deco inspired shaping and curves in this cowl, its just beautiful! The cowl is knitted flat and then stretch blocked before being seamed. I actually hesitated briefly before knitting this because it was seamed, which is patently ridiculous as the seam is only about 30cm long. Not at all the same as seaming a jumper or anything tedious like that! I used blocking wires to stretch the finished cowl out to the dimensions in the schematic, and I love how straight the edges turned out, it made the seaming even easier. I love how this cowl turned out, it really will be the perfect lightweight scarf for chilly spring or autumn mornings. I found it was useful even in the freezing driving rain we had this week, as it’s small and lightweight enough to tuck inside the collar of my fully zipped up raincoat. 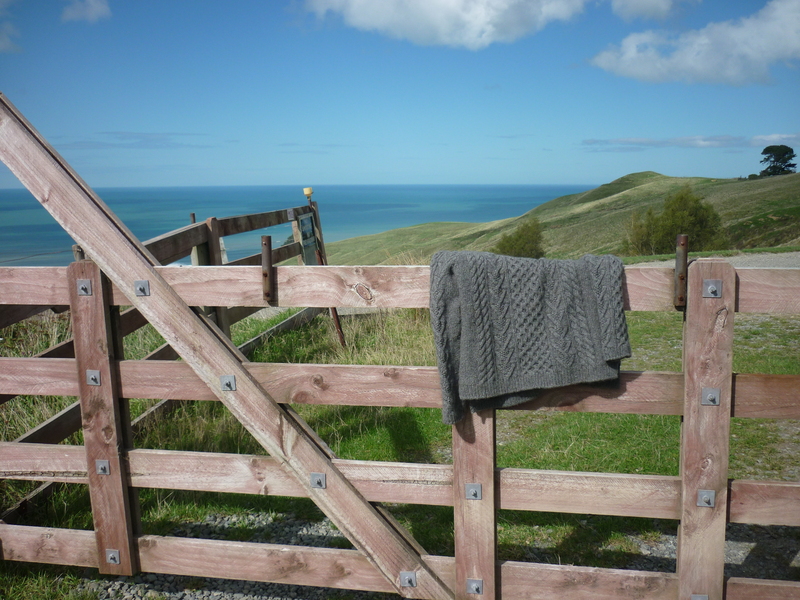 It stayed dry, unlike a my regular scarves which tend to get wet and then slap me in the face with a soggy end, and it was insulating enough to keep the southerly from blowing into my hood and down the back of my neck. I enjoyed knitting the brioche too, once i got my head around how it worked! I’m considering making another version of this pattern but using the beautiful skein of 4 ply MadTosh merino light I have in my stash. I can’t see any reason why it wouldn’t work, as long as I size up my needles appropriately, right? It’ll just be a bigger version of this one, hopefully! It’s a bit weird, I absolutely hate sewing for other people, but I rather like unselfish knitting. Maybe it’s because I know that there are only so many hand knitted things I need for myself, but I really like the process of knitting, so knitting gifts gets around that problem. I also find that people really appreciate hand knitted gifts (or maybe I only knit for people I know will appreciate it), which is always nice. I decided I was going to knit a scarf for Hamish for his birthday…last year. I got it done on time too, but it’s taken me just over a year to get photographs of it! Such a bad blogger. This is another Brooklyn Tweed pattern, the Guilder Scarf by Jared Flood. 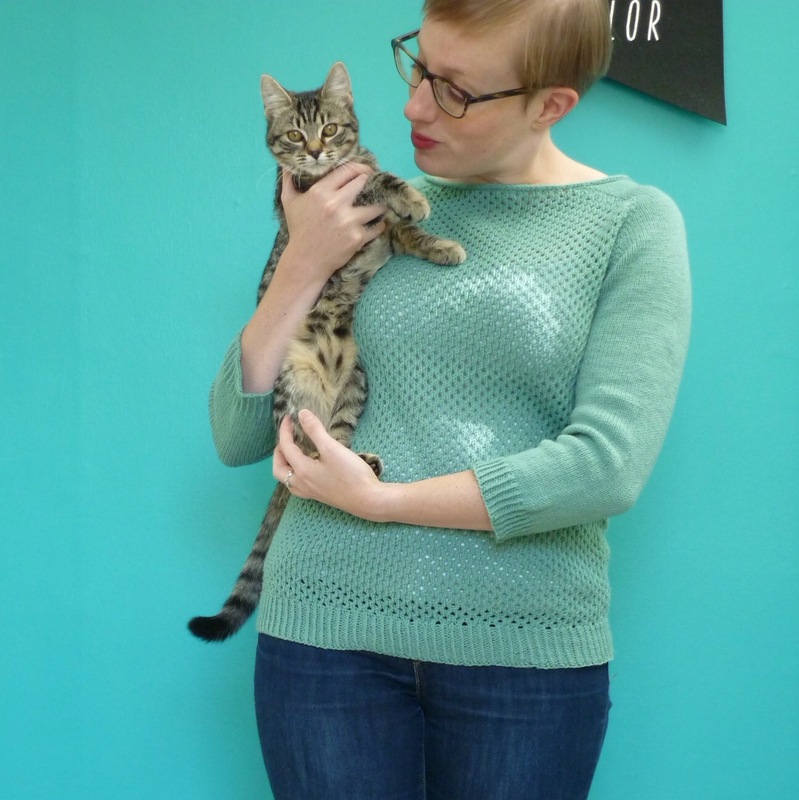 It was the first thing I made in Zealana Heron, and it definitely made me want to knit my Bronwyn Sweater in it! I picked the Bottle Green colourway, I thought it would be more interesting than grey or black (which is mostly what he wears in the winter), and I like the way it looks on him. This was an ambitious pattern for me to pick a year ago, the cable pattern is pretty dense and it took me a lot longer to knit than I expected! To be honest, I was wildly optimistic and decided I was going to knit this a month out from his birthday, so any pattern was going to be a stretch. I must have worked on it every spare minute of that month, trying to keep it hidden from him was a nightmare! This pattern taught me a bunch of new techniques, it was the first time I had done a tubular cast on and tubular cast off, and the first time I tried knitting an I-cord. The I-cord edging is a really nice feature of this pattern, it looks so tidy and I love how it matches the rounded edge created by the tubular cast on/off. I did manage to get it finished in time, though I was sewing the Kitchener stitch for the bind off on my way home from work on his birthday! I think it was only wrapped up for about 20 minutes between me finishing it and me giving it to him over his birthday dinner. Consequently, it’s unblocked. I meant to block it after giving it to him, but unsurprisingly I’ve never got around to it. It’s actually pretty even, and doesn’t look like it desperately needs it! He wore it lots last winter, and when I realised that he’d taken it away with us at Easter, I took my chance to get some photos at last. I also took my chance to get some photos of one of the merino tee shirts I made him for Christmas. The pattern is the Men’s Classic Tee Shirt pattern from the Great British Sewing Bee Fashion with Fabric book. It’s a slightly drop shouldered tee pattern with sleeve cuffs, which I have just hemmed like usual because they kept unfolding and were driving him nuts. I’ve made him three tee shirts from this pattern now, they fit him pretty well and he wears them all the time. This one looks too tight and wrinkly in these pictures, but I think it’s just a bit twisted because he took his jumper off just before I took these photos! It is a slim fitting tee-shirt, which he likes. 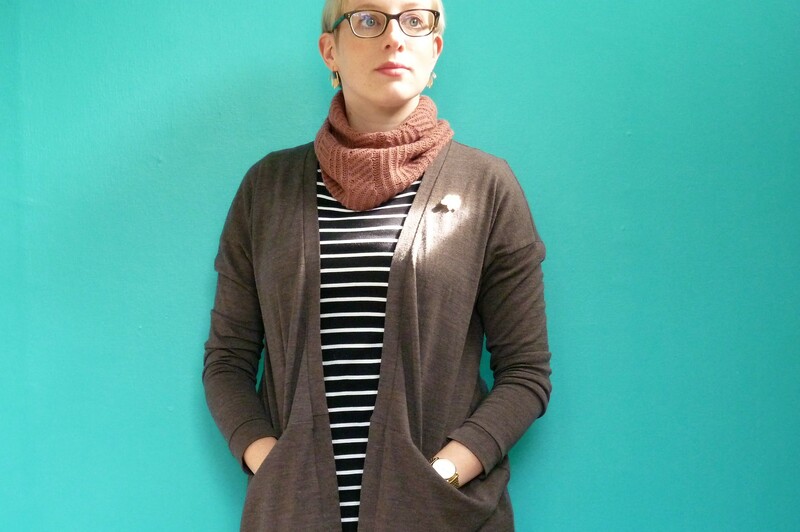 This one and the first one I made are sewn up in merino jersey from The Fabric Store, and the third is made in a really lightweight merino loop-backed sweatshirting. I sewed them all up on the overlocker, and used a twin needle for hemming and top stitching the neckbands. Happy Easter/ long weekend everyone! 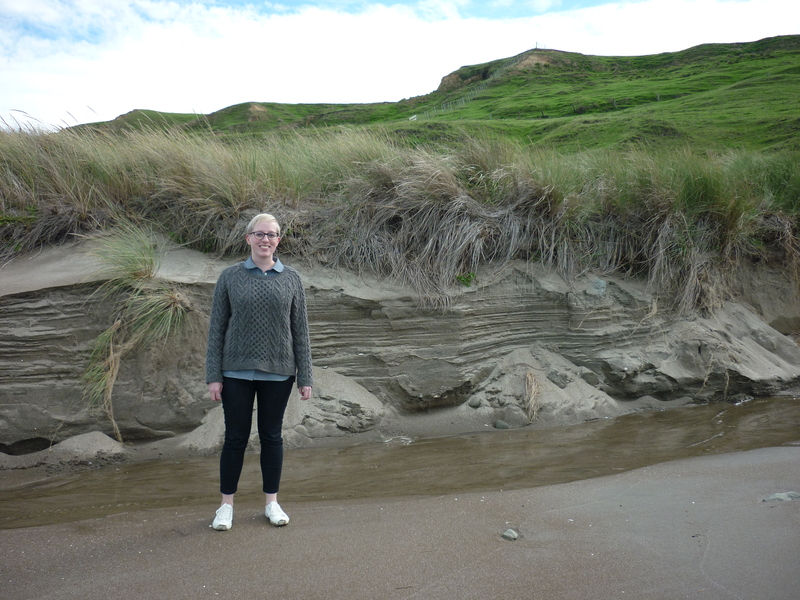 We made our annual trip out to the boonies to spend the long weekend dancing Balboa and eating excelent food in a rural lodge overlooking the sea, which is always a nice relaxing time. 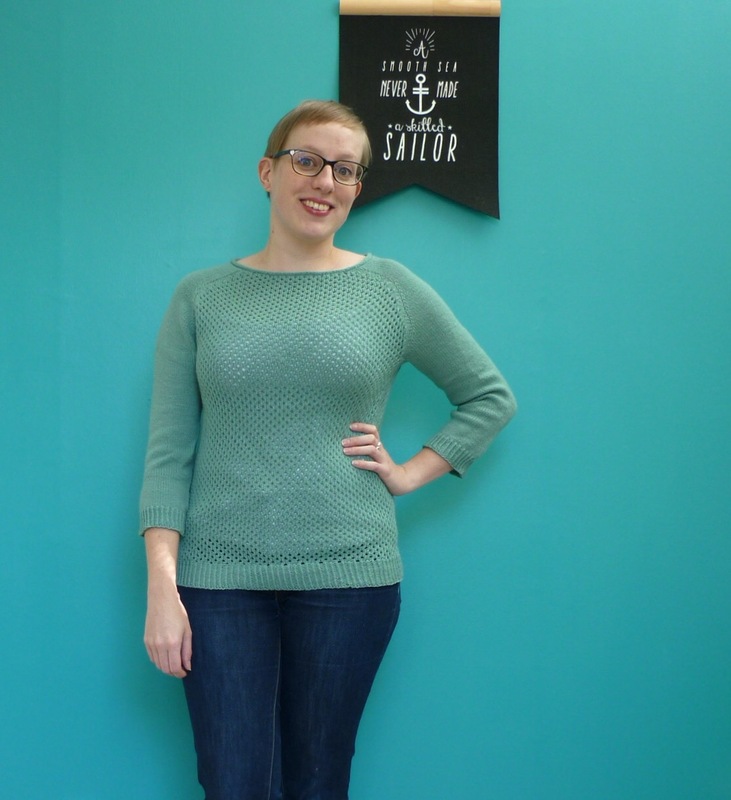 It’s also a gorgeous environment to take photos (away from the teal wall), so I took advantage of the scenery and of my friend Lauren’s willingness to be photographer to get some pictures of my recently finished Bronwyn Pullover. I loved this pattern as soon as I saw it on the Brooklyn Tweed Instagram page! 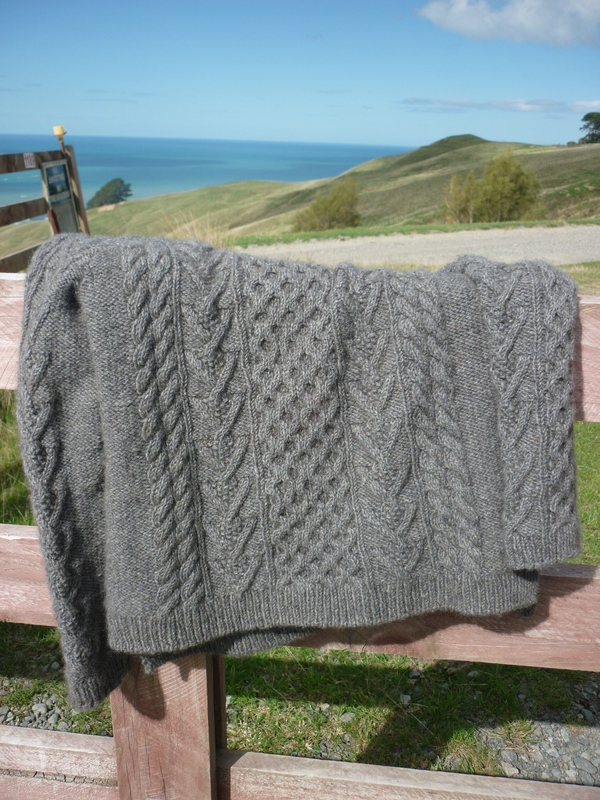 It’s by Melissa Wehrle, and was released in May last year as part of the BT Wool People 10 collection. I had been planning to knit another cabled Brooklyn Tweed pattern as part of my #makenine2016 plans, but I switched patterns once I saw this one. Ravelry says I started knitting this in July last year, so I was apparently a bit ambitious thinking I would have it done by the end of the year… To be honest I could have knitted it faster, but I got distracted by a couple of other projects and then the idea of knitting it over summer wasn’t so appealing, so it’s taken me about 7 months to complete! The wool is Zealana Heron, a 10 ply merino/possum blend. This is actually the second thing I’ve knitted in Heron (the first has been finished for over a year, but only got photos last weekend, whoops), and it is so lovely. The yarn is almost felted together, so it just looks like a single fuzzy, lofty strand rather than two or three strands twisted together. I’m sure there’s a technical term for that, but hopefully you know what I mean! The 20% brushtail possum fur gives the jumper a lovely soft halo, and makes it super warm. 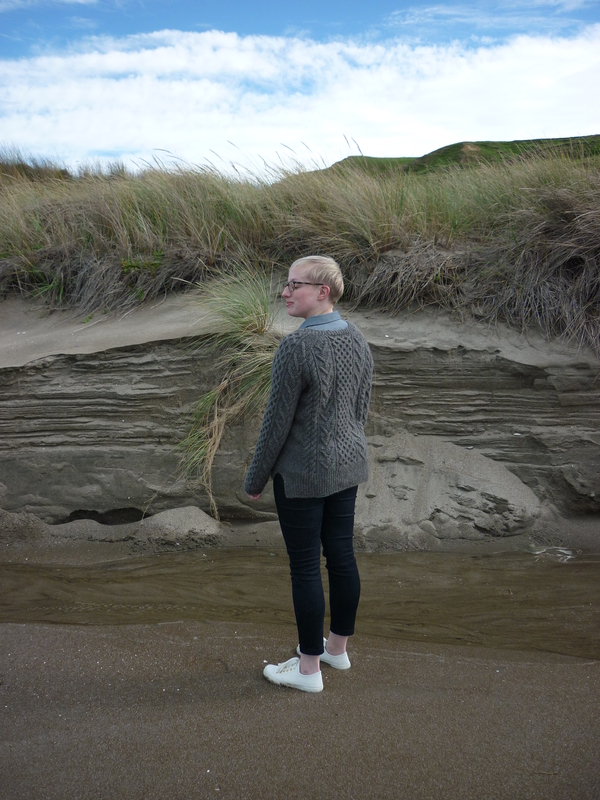 As well as feeling amazing, I also just like the idea of wearing something knitted out of NZ wool and which directly aides in the conservation of New Zealand native bush by using possum. I know possums are considered cute fluffy little critters in a lot of the world (Australia, looking at you), but they’re a conservation disaster in New Zealand. They eat the eggs of our native birds (which need all the help they can get, given that a lot of them can’t fly and so nest on the ground), and are massively destructive to our native flora as well. 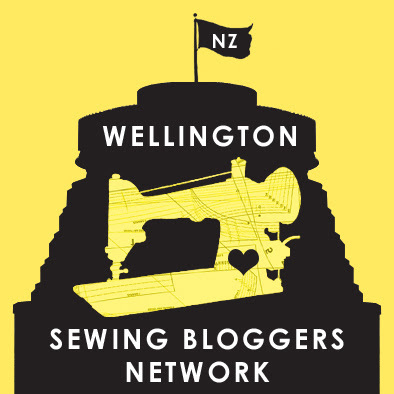 So there are plenty of reasons for me to keep knitting with Zealana Yarns! This pattern has you knit the jumper in several stages. 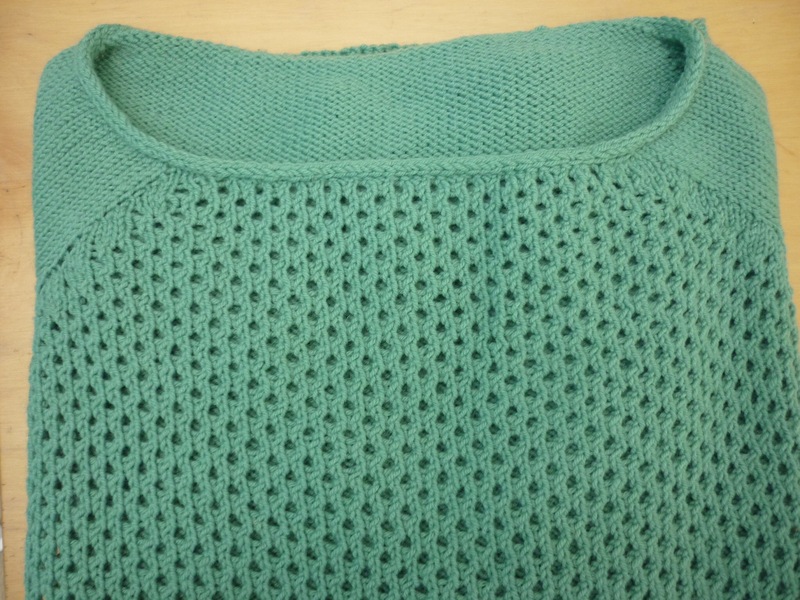 The front and back hem ribbing sections are knit separately, then are joined in the round and the body is knitted up to the armpits, where the front stitches are put on hold while the back is shaped for raglan sleeves, then the front is picked up and finished in the same way. Both sleeves are knitted the same from the cuff up in the round, until the raglan sleeve cap, which is different on each sleeve of course. 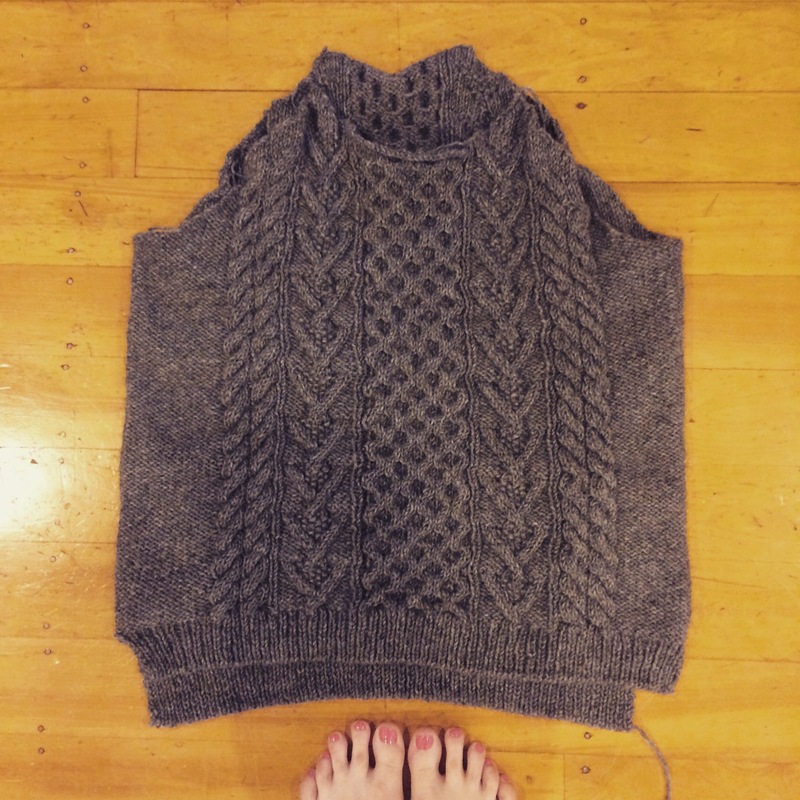 Then the whole lot is seamed together, and the neckband is picked up and knitted. I like knitting in the round, but I also like that the sleeves were knitted separately, as there is a lot of jumper to cart around by that point! This method kept things manageable, but also minimised the seaming (which I’m a fan of!). This was a really fun project to work on, once I got going. The cables were easy enough to keep track of after a few repititions, and there was enough variety to keep it interesting to knit! I used to hate doing a tubular cast on, even though I love the result, because it’s so fiddly and always seems like it’s going to collapse when I take out the waste yarn (I’m still not too sure why it doesn’t, must be witchcraft), but after doing a tubular cast on for the front and back and both sleeves, I might have got over my dislike. I do really love the split high/low hem, it’s such a nice touch. 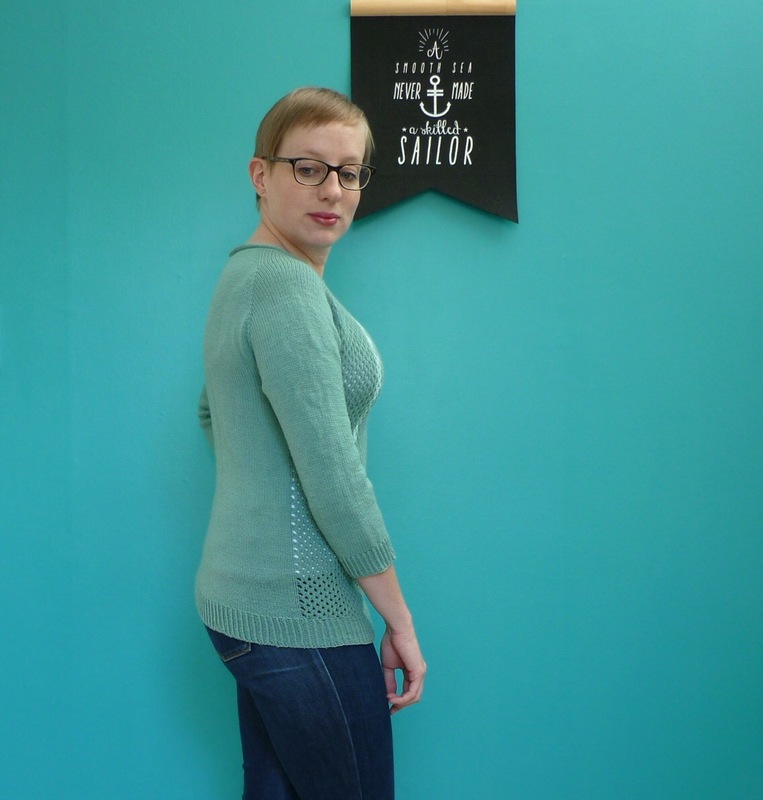 In fact, I enjoyed all of this jumper, except for the Kitchener stitch bind off for the neckband! I don’t think I’ll ever get over my dislike of Kitchener stitch, I just can’t get my head around the pattern of knit/purl/slip movements to make with the tapestry needle, I’m constantly referring to the tutorial on The Purl Bee. It’s bearable when it’s 12 stitches for the toe of a sock, but the 114 stitches around this neckband were a mission. I couldn’t bear to have the neckband not to match the cast on edges though, so I just sucked it up and did it! 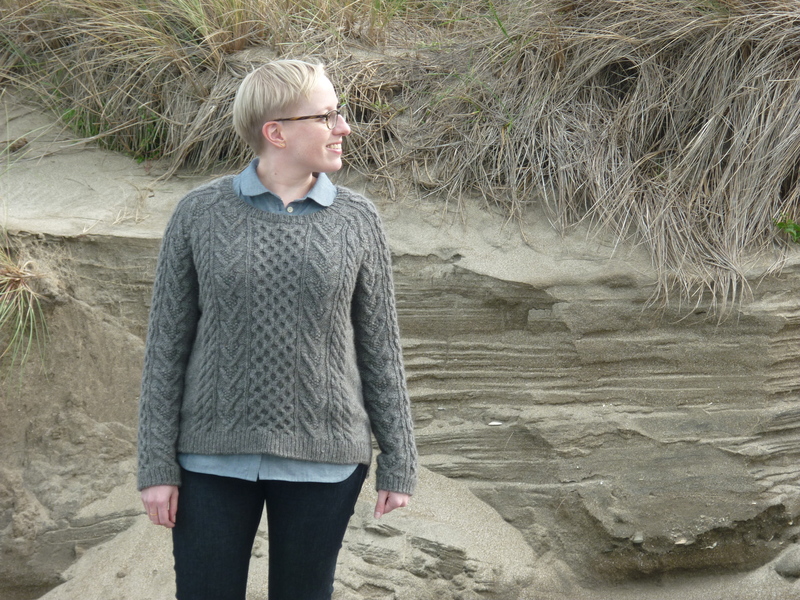 This is the Carpino Pullover, from Brooklyn Tweed Wool People vol. 6. 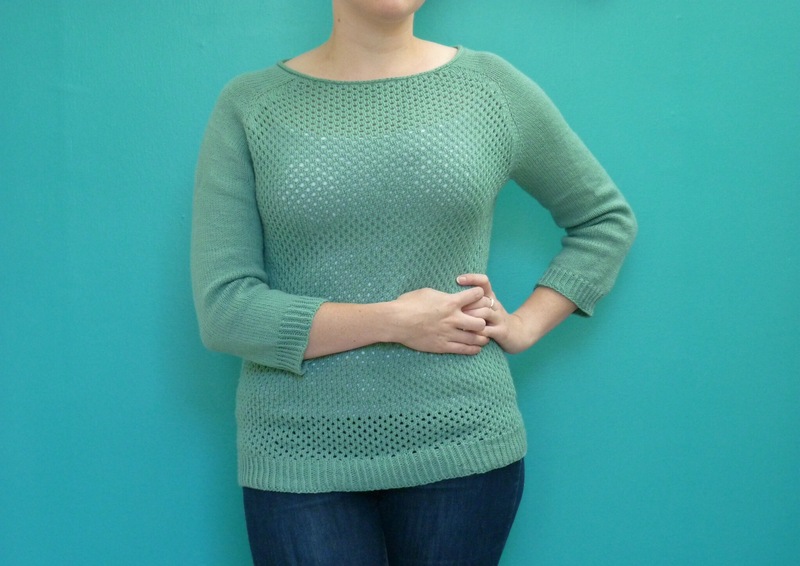 It’s a 4ply jumper knit top down and in the round, with a mesh/lace panel on the front. 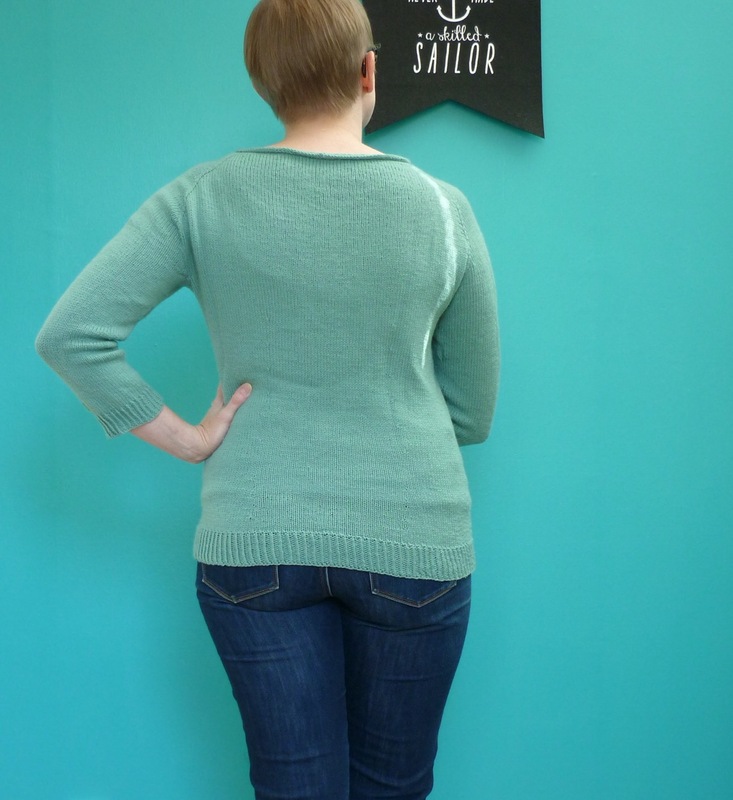 I really love the shape of this jumper, I was initally attracted to the boat neck with the i-cord neckband and the curved lines at the raglan sleeve/body junction. It didn’t hurt that the sample was knitted in my favourite mustard colour either! 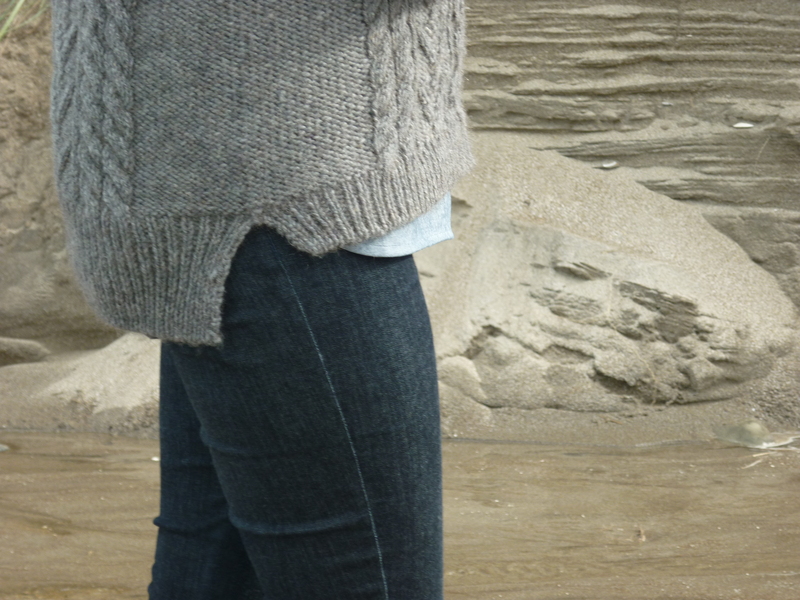 The pattern has the waist shaping on the back of the jumper instead of at the side seams, and I love how it fits. It hasn’t completely removed the pooling I get at the small of my back, but it has reduced it considerably! I would definitely consider borrowing the shaping from this pattern for some others.